It seems like the slower weekends are easy to forget to take pictures…and also then forget to post. This happens on the busier weeks too… Weird… Since this is a double dose, I will try and keep it short! Enjoy! A wonderful slog-fest…phew! • The weather was amazing! Minus the higher humidity (than I am used to at this time, not overall), the upper 60s with a cool breeze was the perfect setting for a morning run. You read that right – a MORNING run! I finally busted he snooze button this morning!! • The slog-fest is due to restless sleep last night, tired legs, the lightening scare (it was 30-50 miles away and not getting closer, but looked closer! )…and said humidity. • While I with my run FELT better, I'll take what I can get! Tomorrow is going to be a rainy mess…not looking forward to it at all. The packet pick up and pasta dinner was held at the senior center. There was good food and many people sitting or wandering around. Little man enjoyed the “house picture” that they had hanging in the space, so we good a few pictures before heading home. When we got home, it was bed time for all of us! An early start to the day, but not as early as I planned. 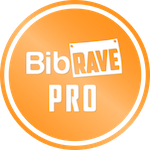 My training plan called for roughly 18 miles – 13 easy paced, then 5 faster or marathon race pace. Since it was raining all night and most of the day, I decided not to run my first 5 before the race and just jog the 1 mile to the start. I would figure out the rest of the miles after the race. I stopped by the packet pick-up area – mostly because it was a tent and I could stay out of the cold. Before long, it was time to line up and run my first timed 13.1 of the year! The course was nice, the aid stations were okay, the turnaround point was awesome, and I ran the race without taking a glance at my Garmin. I was running without any thought on the time – mostly just the effort. I’d say I was running mid-moderate effort – but my Garmin shows a little differently. I don’t think my watch was tight on my wrist because it said that my HR didn’t go much over 140 – which could be partially true since it was so cold and rainy… Oh well. Once the race was over, I headed back to the tent to get my drop bag, find the bus to get back to my car, changed my top layers in my car, and headed to the gym. I called to check on little man and the grandparents and they were heading out of town for a couple hours. Fine by me…I still needed to get in a few more miles for the day. …and with that, I am done running…for today 💥💥 • — 1 mile run from the parking lot to the start of the half marathon (in the rain) –13.19 miles of the #WickedHalfMarathon (in the rain) — 6.01 miles easy on the treadmill (out of the rain) • All in a good day of running!! I hopped on the treadmill in new, dry, clean clothes to get in some easy miles – since my race was run a little faster than I anticipated. After the gym, I drove by and picked up some coffee…just what I needed to warm up and caffeine up! When I arrived home, the family was all hanging out. The plans quickly changed as they were heading out of town and they decided to stay after all. Little man was down fora nap, but only for a few minutes when I came home. So he was pouting for me to come give him hugs and kisses and I convinced him to take a nap. A couple hours later, the grandparents came back and we talked for a little bit before little man was up and ready to play! We played for a little while before the grandparents needed to hit the road. The evening was spent watching a movie and relaxing. Much like other Sunday mornings, I didn’t start with a run. The rain was still falling, so I decided to wait. 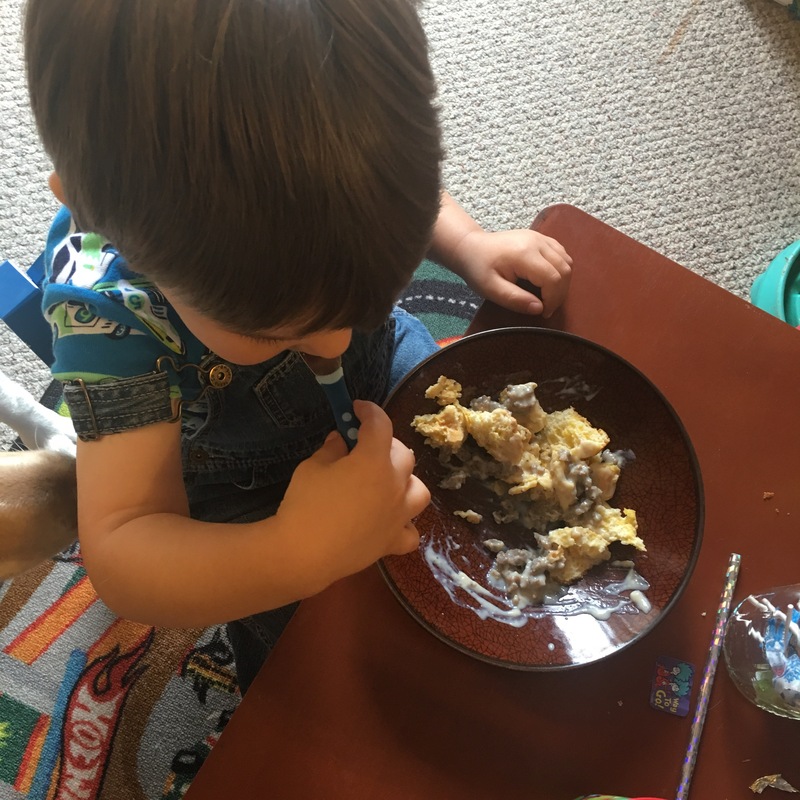 Little man woke up early and the hubs made us some biscuits and gravy. Yum! The rest of the day was much less exciting. There were messes, messes made bigger..,and eventually they were cleaned up! Toward the end of the day, when the hubs came home from spending the day out and about, I was finally able to get in 1 mile – keeping the streak alive!! Decent eats for the day, check! When my alarm went off this morning, it was a struggle… After a while, I got out of bed and got ready to run. I knew the weather was going to be wet today, but I wasn’t sure how early. When I checked my phone at approx. 4:30 am, the radar showed the storm within 30 miles around 5:20 am – this meant that I could get in a few miles before the weather was too close for comfort…and some of the lightening I saw made me tuck tail and head home fast! So rather than “settle” for 5 miles, I waited out the storm and headed to the gym (which opens at 7 am on the weekend). I didn’t have a lot of time to in before needing to be home to see off the hubs for work…so I get done what I could. Once I got home, little man was up and ready to get the weekend started! I knew of a morning event in town and we decided to go! One of the churches was hosting the Boy Scouts and they were serving all-you-can-eat pancakes! Once we got our fill and terrorized the area, we headed to the library! 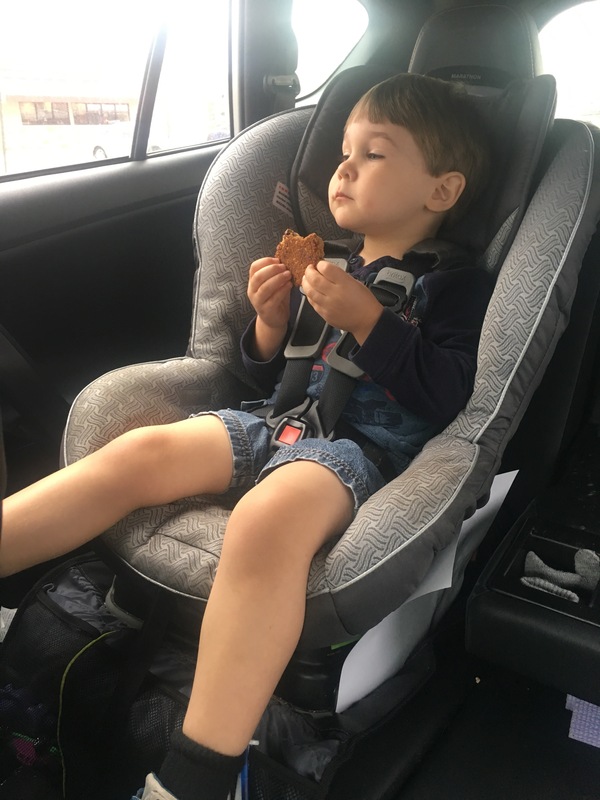 Originally, the library wasn’t on our list, but I knew there was a lot of sugar in that syrup and little man would be going a little stir crazy at home. Good thing we went to the library when we did, because there was a Family Fun Storytime set up at 11 am! I didn’t know about this reading until this weekend or we would have gone more often before now! Little man was nervous about all the people and wanted me to dance with him…but I insisted that HE danced! So fun! After the reading, dancing, singing, interactive storytime, we headed into the children’s area to read and play a little more. After a few hours, we were up and making messes all over again. 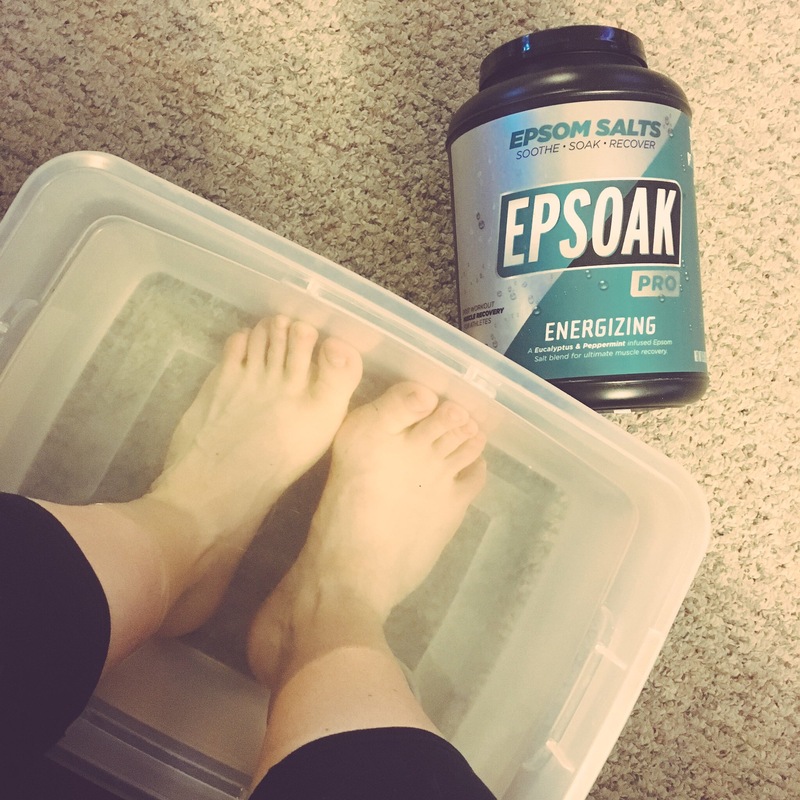 I decided to break out my Epsom Salt again and let my feet soak for a little while…I have been piling on some miles lately and the soak is good for my feet and senses (lavender…yes!!). Little man and I started making breakfast and playing cars. 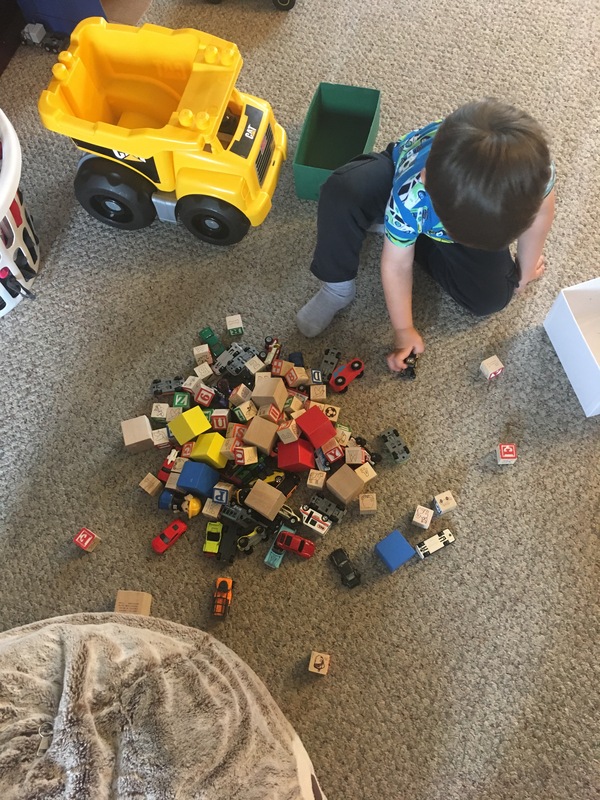 Between eating and cleaning up the house, we played cars across the livingroom. He has a couple small trucks that propelled themselves of you pull them back, so we went back and forth across the living room door for quite a while…he enjoyed it! 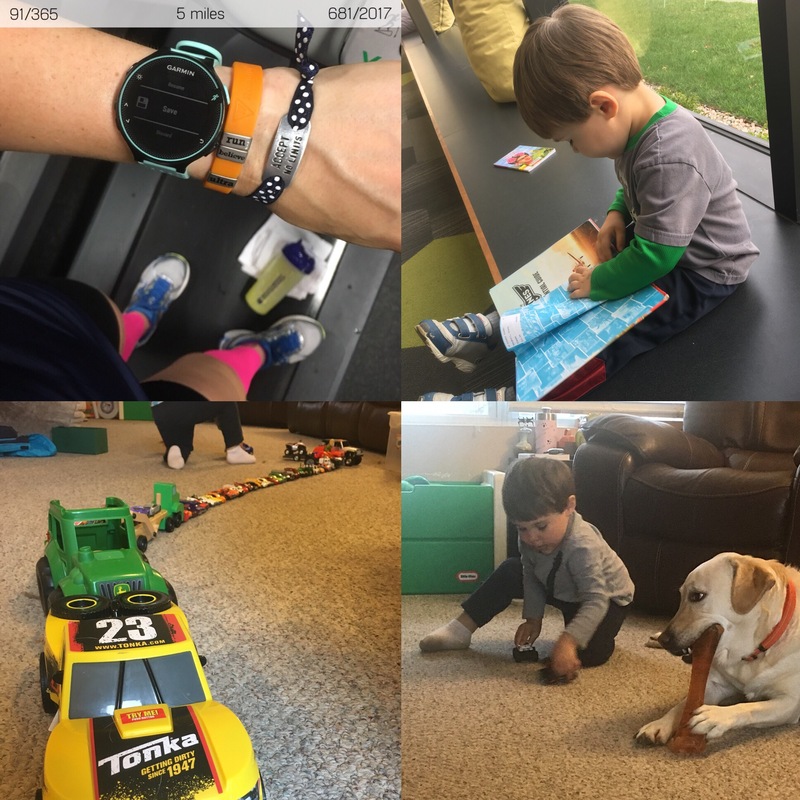 When the hubs came home, I put little man down for a nap, finished up my “projects” (dishes, laundry, the usual suspects) and then got ready to run! 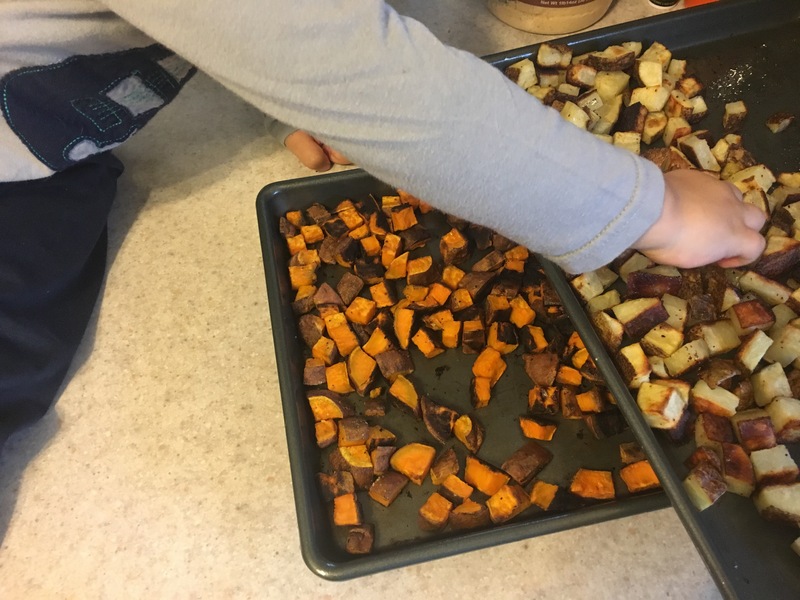 Once I got home, but guys were still napping (rough life) and I relaxed for a bit… The hubs had plans and left soon after – and little man and I had some leftovers for dinner. 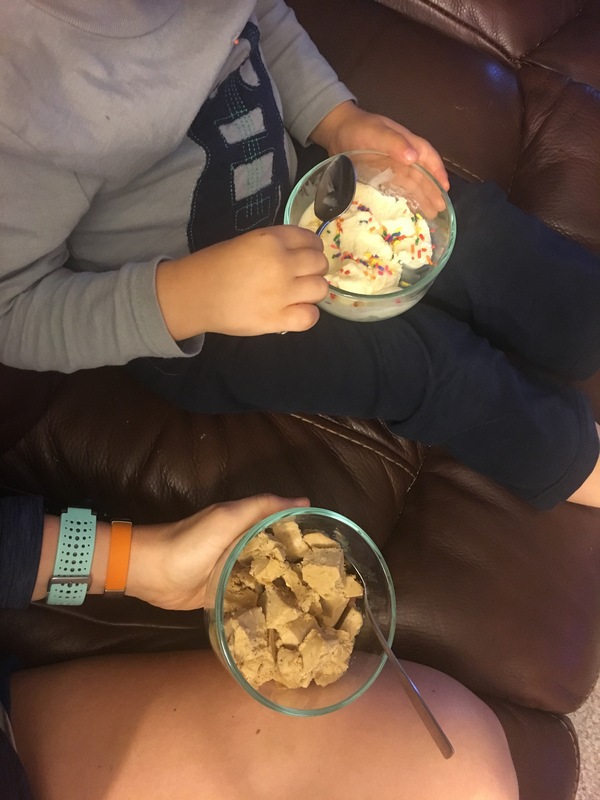 We settled into a movie and since we bought some ice cream, little man had some while I indulged on some homemade banana ice cream 🙂 Yum! 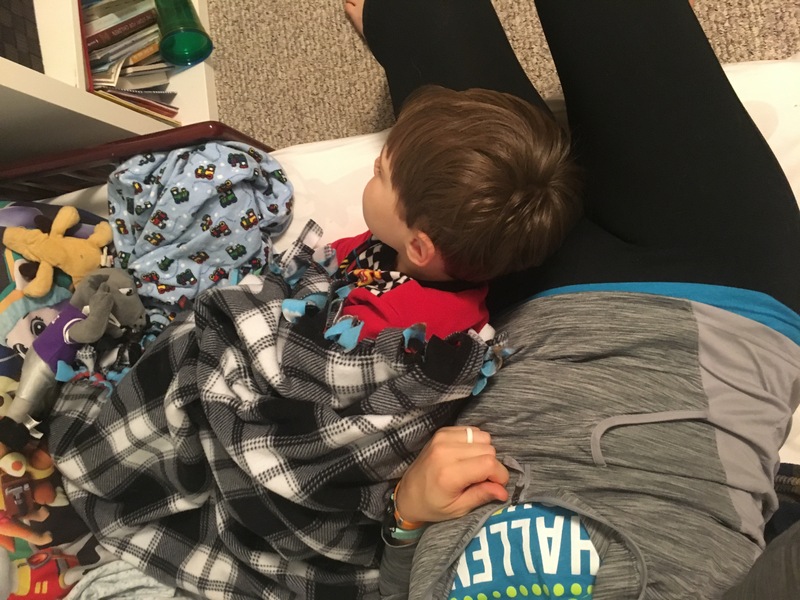 After the movie, I was a human pillow again for a bit and then off to bed we went!